33 books = $10 = all for charity. Go me. I do it anyways cuz I am pit bull! Did you score at a charity sale? I love inexpensive used books! I did! Twice a year they do booksales up in Sac. This is the first one I attended - some of the people are a little TOO into it but it was all good fun. It's for a cat charity, though now I can't remember which charity. 'Round these here parts, I go to the Catholic rummage sales for the best in used goods. Last time I scored a lovely Dickens collection (printed in 1877) and Diet for a New America (I always stock up on this title so that I can give it to new or wannabe vegans). There are two more sales this summer. Can't wait. Ohhhh I'll be sure to tell you when I go in case you're off that day. Make sure have a box of kleenex handy for The Deep End of The Ocean! I know! I'm so very excited! My mom said the same thing...I'll have to wait for a melancholy mood to strike before I read it. 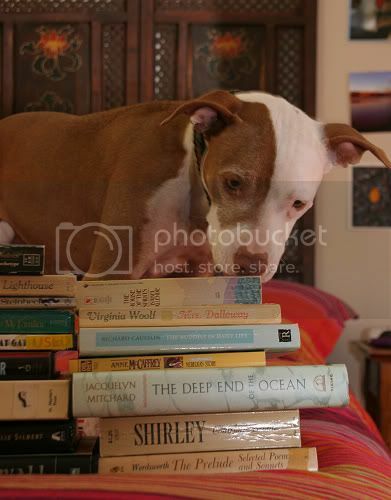 Pit bulls and books .. this is my kind of post!! I couldn't agree more. 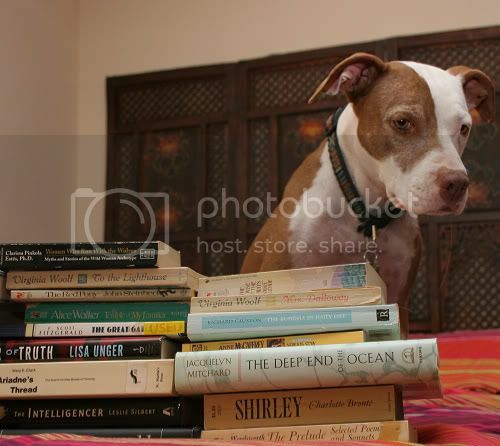 Even better is when I'm reading a book with a pit bull head resting on my lap (attached to her body, of course). Mina is totally love. My parents' poodle actually does like to eat hard-cover books. 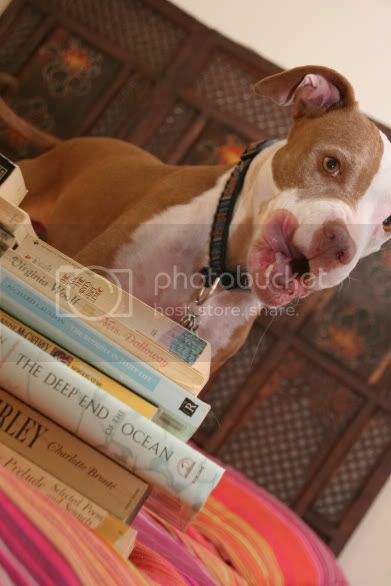 I am very thankful Mina does not rule at eating books because that would be tragic.